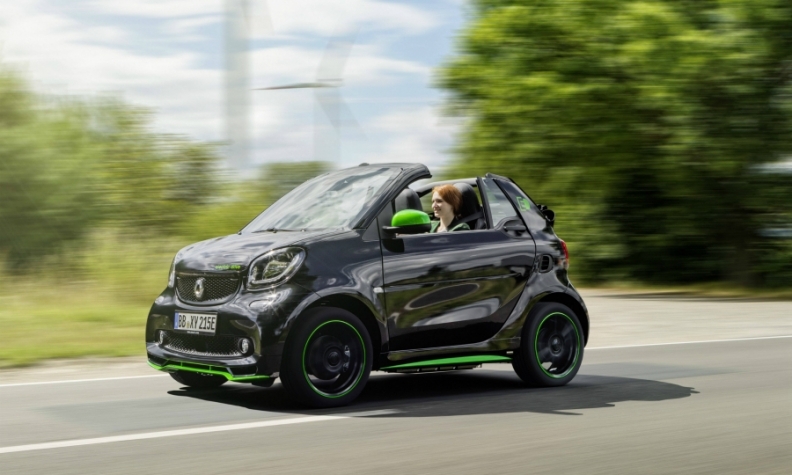 Daimler will sell the electric ForTwo and ForTwo convertible (shown) in the U.S. and Canada. WASHINGTON -- Daimler will stop selling combustion engine Smart cars in the U.S. and Canada and focus the brand on electric vehicles in the two markets, the company said. Dietmar Exler, head of Mercedes-Benz USA, said in a letter to dealers seen by Reuters that the sale of Smart cars with gasoline engines would stop when the 2017 model year ends this fall. It is the latest sign of struggles for minicars in the United States. "Developments within the micro-car segment present some challenges for the current smart product portfolio," Exler wrote on Monday. "A dedicated focus on the electric drive in the U.S. and Canada provides a logical step to support a sustainable, zero emissions future." The automaker will sell battery-powered versions of its Smart ForTwo and ForTwo convertible models in the U.S. and Canada. The change does not apply to other markets outside North America, Daimler said. Mercedes sold 6,211 Smart cars in the U.S. last year, down 16 percent over 2015, as gasoline prices in the country have remained low. That is compared with global sales of Smart branded vehicles of 144,479.